Guantanamo Bay on the southern tip of Cuba has been an American naval base ever since 1898, used from the 1970s as a detention camp for Cubans and Haitians caught attempting to slip into America by sea. After the invasion of Afghanistan in October 2001, President Bush found a chilling new purpose for it: Guantanamo was converted into a high-security detention center and declared to be beyond the jurisdiction of US law and the articles of the Geneva Convention. 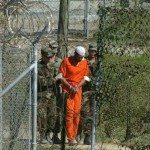 Governments on both sides of the Atlantic deemed it a perfectly reasonable ethical response to an extreme situation and hid behind euphemistic catchphrases: apparently the ‘war on terror’ demanded the ‘extraordinary rendition’ of ‘enemy combatants’ to undergo ‘coercive interrogation’ for the sake of our very survival. Since its inception, at least 775 captives have been detained in Guantanamo, around 420 of whom were eventually released without charge. Many of these had been rounded up randomly by Afghan tribesmen in exchange for bounty money; among them were children as young as 13. It was US policy to keep the prisoners’ identity secret and information as to what was going on in Guantanamo dripped out slowly: detainees were routinely subjected to ‘unorthodox interrogation techniques’ including beatings, sexual and cultural humiliation, sleep-deprivation, prolonged stress positions and exposure to heat, cold and unbearable noise, and the infamous ‘water-boarding’ torture of semi-drowning. The world was aghast at the depravity of the US administration. But it was not until 2006 that the British government, after much blustering, tentatively declared that Guantanamo was ‘an anomaly’. Its very existence demonstrates just how easily the democratically elected government of a ‘civilized’ country can trample on fundamental human rights. America’s reputation as the world’s guardian of liberty, justice and truth was in tatters. There were many attempted suicides, at least four of which were successful, and three deaths have been attributed to suicide by the Pentagon. The detainees have all been left with permanent physical and psychological scars. At least 60 of the detainees were boys under the age of 18, some as young as 13. You should know: In January 2009 some 245 detainees were still incarcerated; by November this had been reduced to 215. Of these it is anticipated that between 60 and 80 will eventually stand trial, though it is not known when nor what they are to be charged with. The remainder will be freed – eventually. No more than 24 prisoners were closely linked to the terrorist organization al-Qaeda and only one is an important international terrorist – Mohamed al-Kahtani, who is thought to have helped plan 9/11. On January 22 2009 President Barack Obama ordered that Guantanamo detention camp be closed within a year. This is turning out to be easier said than done. No country is willing to accept the remaining detainees, so the US government doesn’t know what to do with them.